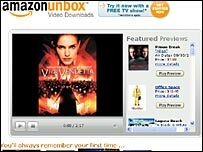 Online shopping giant Amazon.com has launched a digital TV and film download service in the US called Amazon Unbox. Backed by top Hollywood studios and TV channels, including Warner Brothers and CBS, Amazon Unbox will offer programmes and films direct to users' computers. Amazon's move into the online media business reflects huge growth in the demand for digital entertainment. Computer and iPod firm Apple is widely expected to unveil a similar service on 12 September at a launch in the US. Amazon's new download service is currently only available in the US, and offers TV shows for $1.99 (£1.06) per episode and movies for between $3.99 and $14.99. Amazon Unbox should work on any personal computer that runs the Windows XP operating system and has broadband internet access. Viewers can begin watching a film while it is still being downloaded, giving users almost instant access to the media content. The ultimate objective is to extend Amazon Unbox to TV screens and small portable devices according to one of the participating studios, Sony Pictures. Amazon hopes that digital entertainment will prove to be a lucrative new market as its established online shopping service faces intense competition. The company recently reported that profits for the three months to 30 June fell 58% to $22m. Martin Pyykkonen, an analyst at Global Crown Capital, said that the new service could prove a lucrative source of revenue for Amazon. "This is a much better business than anything they've done before," Mr Pyykkonen said. However, other analysts said that the appeal of the service may prove limited as it would not be compatible with a number of media players or hand-held devices most importantly Apple's best-selling iPod. Apple already offers consumers the opportunity to buy and download music videos and television programmes in the US through its iTunes music store. Also, many viewers will want to watch films and TV shows on their televisions rather than their computers, which often produce a poorer quality images, said Jupiter Research analyst Michael Gartenberg. "In the short term, Unbox is not a real threat to Apple," Mr Gartenberg said.